Inter lost 3-2 in the second leg of their Coppa Italia semifinal against Roma to be eliminated on an aggregate score of 5-3, but their melancholy vibe began long before the match even started. And if their banners at the San Siro are an indication, that feeling has been growing since Jose Mourinho left the club after winning the treble in 2010. "After Mourinho we feel like orphans of someone who knows how to convey the sense of belonging to these colors," read the banners draped from the upper level of the stadium that could be lyrics from an upcoming Morrissey song. They've had five managers since Mourinho left for Real Madrid starting with an embarrassing five months under Rafa Benitez and now with Andrea Stramaccioni, who has Inter sitting seventh in the Serie A table this season. Mourinho recently said he would not return to Inter next season, but that he'd "like to go back one day." 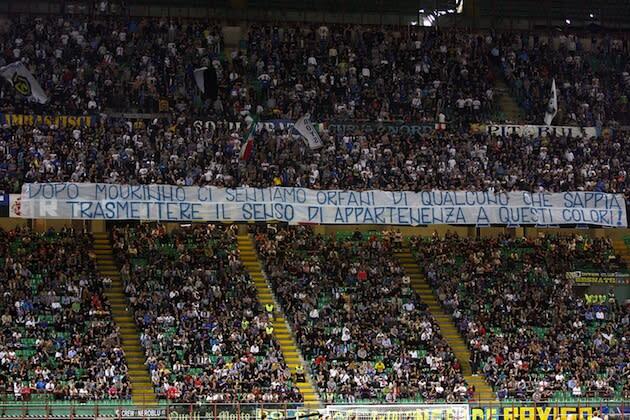 Inter fans weren't the only ones invoking Mourinho's name in recent days. 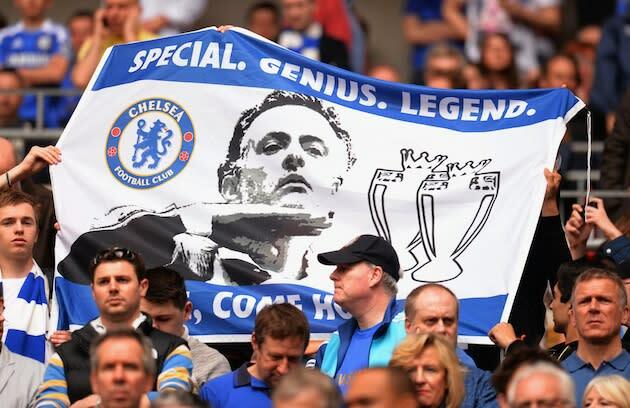 Chelsea fans continued their pleas for Mourinho to save them from Rafa Benitez's stint as interim trophy killer during Chelsea's FA Cup semifinal loss to Man City at Wembley on Sunday with a flag that read "Special. Genius. Legend. Jose, come home." As for Benitez, who also said that he would like to return to former club Liverpool, well, Brendan Rodgers has made it clear that he's not welcome.